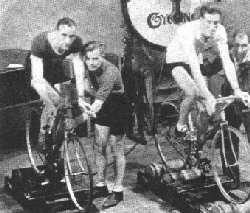 The Vegetarian Cycling and Athletic Club began in 1887 and was formally founded in 1888 as the Vegetarian Cycling Club - the first President being the ubiquitous Mr Arnold Hills. 'and athletic' was added in 1909. VCAC is still flourishing today and is, as far as we know, the second oldest contiuously operating vegetarian organisation in the world. The Vegetarian Cycling Club. - At the conclusion of the first season I have to express my thanks to the few gentlemen who have co-operated with me to make the Vegetarian Cyclist's Club an accomplished fact. I have at present the names of 14 members resident in London, and I hope that others will come forward and considerably increase this number before next spring. not one single cyclist resident elswhere (even in Manchester) responded to my request that all riders should send their names, etc. (see V.M. for August,) How is this? Is lack of faith, or of post-cards the explanation? The statistics would be very interesting and useful, and might lead to the formation of local clubs. I am surprised at the indifference displayed by Vegetarians generally in this matter. It is not creditable. Here is a ready and pleasant mode of making known our existence, and gaining recognition among athletes, and every manly instinct should prompt those hwo know how good it is to be humane and healthy to ride occasionally in congenial society. One chief object of my attempt to organise our forces is that when there is held a great meeting and parade of clubs at Bushey Park or Hayes Common, our principles may be represented. Early next season I shall re-commence summoning all and sundry to turn out gallantly and show the world how those who live without carrion can enjoy the true pleasures of life. We will have exercise, fresh air, the beauties of nature, ideal picnics, and merry returns to London afterwards, with vocal harmony to shorten the way! This sketch is not altogether drawn from imagination, as we have had three successful runs since the formation of our club in August, which was too late a date to hope to do much more than prepare for next year. - Leslie Large, 1 Cambridge Terrace, Hither Green, S.E. Vegetarian Cyclist's Club. - The above club had a moonlight run on Friday, starting from Hyde Park corner at half-past six, via Battersea Bridge, to Clapham Common, at the N.E. corner of which the muster took place. Only ten members attended, in consequence of the recent bad weather. The start took place at 7-27 from the post office, the route being through Tooting and Merton. Kingston Church (the Market Place) was reached at 8-31 - not bad time considering the heavy state of the roads. A "tomato supper" (not "oyster") was indulged in at the Leopold (temperance house), where fresh lemonade, oranges, &c., were provided, and after an agreeable chat about the progress the club is making, the steel bands were again led forth. The return being through Kew and Hammersmith no time is recorded, as the members divided somewhat to reach their several homes in various and distant parts of the metropolis. The V.C.C. already numbers seventy-one members. The evidence of such performances in favour of a non-flesh diet is not to be gainsaid, and when the club is properly organised it is believed there will be forthcoming champions of the Diet of Humanity and Health to assert its superiority in the athletic world also. - Weekly Times and Echo, June 24. London Vegetarian Cycling Club. - On Saturday, February 22, at the Apple Tree Restaurant, London Wall, a G.M. of the Vegetarian C.C. took place. There is a nucleus of about 100 already, and the organisers of the club have confidence in the sufficiency of the diet for sustaining the highest muscular as well as other powers of man. The head-quarters of the club to be Charing Cross Vegetarian Hotel in Buckingham Street, Strand, was voted unanimously, badge, a V formed of wheat and C.C. in silver monogram. Colours, the symbolical crimson with blue edges and narrow gold stripes. Uniform C.T.C. and optional. The electiom of officers next took place. Mr. F. W. Hills [sic], president of the London Vegetarian Society, to be president. The Rev. Professor Mayor of Cambridge, Drs. Allinson and Watters, Messrs. Doremus, Hall and Sullivan, vice-presidents. W. H. Browne, captain. A. J. Doult, treasurer. Prominent among the elected committeemen is Malcolm Rae, of North Road fame, 257 miles in a day (24 hours), Messrs. Palmer and Freeman, winners of races, and nine others. The hon. secretary is Mr. L. Large, 1 Cambridge Terrace, Hither Green, Lewisham, of whom further information may be obtained. VegCac was not among the groups who sent letters of support to the first IVU Congress in Dresden, 1908, though they have been members of IVU from time to time. The report from the 1923 Congress, in Stockholm, gives Henry B. Amos, VegCac General Secretary, as the official delegate. Mr Amos presented a paper on " Diet for Strength". In the discussion which followed, Mr. HENRY LIGHT (Vegetarian Cycling and Athletic Club) expressed the view that the protein standard advocated by Dr. Hindhede was insufficient for those undertaking heavy physical work. His chief point of criticism of the conventional English dietaries was that these were made up of unsatisfactory combinations of foods and drinks, and he quoted with approval the remark of Mr. C. H. Collings, the analytical chemist, that ''under healthy conditions protein furnishes an ample supply of base to counteract any possible uric acid formed from itself." He contended that while the body could be sustained on a low protein diet it could not thus be sustained at the highest point of efficiency. There was no specific mention of VegCac at any further Congresses up to 1950. Details from later Congresses wll be added here in due course. The minutes of the IVU Business meeting in 1965 state that Mr Cyril Oliver gave a report for the Vegetarian Cycling & Athletic Club. Fifty years ago - from The Vegetarian 1996, some notes from VegCaC in 1946 including the photo on the right of this page. The Club today can be found at: www.geocities.com/vegetariancac - including a detailed history page.